CARY, NC - The 2019 NCHSAA Men's and Women's Swimming & Diving Championships wrapped up with one of the fastest Championships in the history of the Association. See breif recaps of each meet and find links to full results and stories from the championships here in this article. February 9, 2019 - The North Carolina School of Science and Math brought home the men’s team title, their program’s third state championship. The Carrboro women raced off to their first team state championship in program history. Thomas Hamlet from Bishop McGuinness grabbed the Most Outstanding Performer award on the men’s side, winning a pair of individual events. Hamlet set a new state meet record in the 100 Backstroke touching in 47.82 seconds. Emme Nelson from Community School of Davidson was the Most Outstanding Performer on the women’s side. Nelson set a new 1A/2A Classification meet record in the 200 Individual Medley by powering her way to a time of 2:00.70. 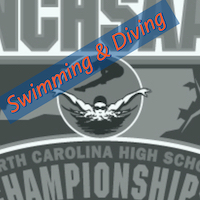 February 8, 2019 - The North Carolina High School Athletic Association’s 3A State Championship Meet was a historical and exciting night at Triangle Aquatic Center. Western Alamance’s Noah Henderson jolted the arena into a frenzy with his record-setting performance in the 50 Freestyle, posting the first NCHSAA State Meet time under 20 seconds in the history of the event. The Marvin Ridge men’s team nabbed their third straight team state championship while the Charlotte Catholic women held off Weddington to win their second straight title. Noah Henderson claimed the 3A Championship’s Most Outstanding Performer award for the third consecutive year. The Western Alamance star bolted to the first sub-20 second time in the 50 Yard Freestyle in the History of the NCHSAA State Championship Meet. Ellie VanNote from Marvin Ridge claimed the 3A Women’s Most Outstanding Performer Award. February 7, 2019 - Leesville Road stopped Hough’s streak of three consecutive team titles in the women’s competition as the Pride claimed the school’s third team championship in the sport and first since 1996. On the men’s side, Green Hope repeated as champions, earning the school’s fourth state championship all-time. The storyline of the day was long-time records coming down, as Max Edwards from Reagan High School broke the longest standing state meet record, winning the 50 Freestyle in 20.33 seconds. Edwards was named the meet’s men’s Most Outstanding Performer. In the women’s competition Claire Curzan from Cardinal Gibbons set a pair of new all classification state records as she picked up wins in the 100 Butterfly and 100 Backstroke. Curzan swam a time of 51.88 seconds in the 100 Backstroke on her way to being named the women’s meet Most Outstanding Performer.